A few days ago, I didn't even know about ice cream bread. Then I saw a post on Katie Loves Cooking. Then I went WHAT?! and started a googling spree. And apparently the whole internet knows that this is a thing, but simply just chose not to tell me about it. Anyhow. Katie's post was swiftly pinned, and instead of leaving it at that (as I normally do), I instructed Marco to bring some ice cream home from his next trip to the grocery store. The only specification I gave was that it be chunky, because that is meant to make the bread more interesting. He choose some chocolate fudge with brownie bits. The only other things you need for this are plain flour and baking powder (or self-raising flour to make it even easier) and I always have those at home. Thinking about it, it really is no wonder that this recipe works, seeing as ice cream has most of the ingredients you need for successful baking: milk, eggs, sugar, and fat. While the recipe was super-easy and fun to throw together, the end result was slightly disappointing. Not to say very. The bread has the texture of pound cake, but even though the chocolate ice cream was almost too sweet to eat plain, most of the sweetness had disappeared after baking. I did heed the advice to use chunky, but the brownie bits were too similar to the rest of the loaf to make a difference. I did throw some chopped dark chocolate on top just before it all went into the oven, and that was this concoction's saving grace. It tasted best with a bit of butter spread on it, and one morning I used it as a base for French toast and that also wasn't too bad. I might try this again using an even chunkier variety of ice cream (cookie dough or nuts are supposed to work well), but for now I can only give the recipe points for it's gimmickiness. 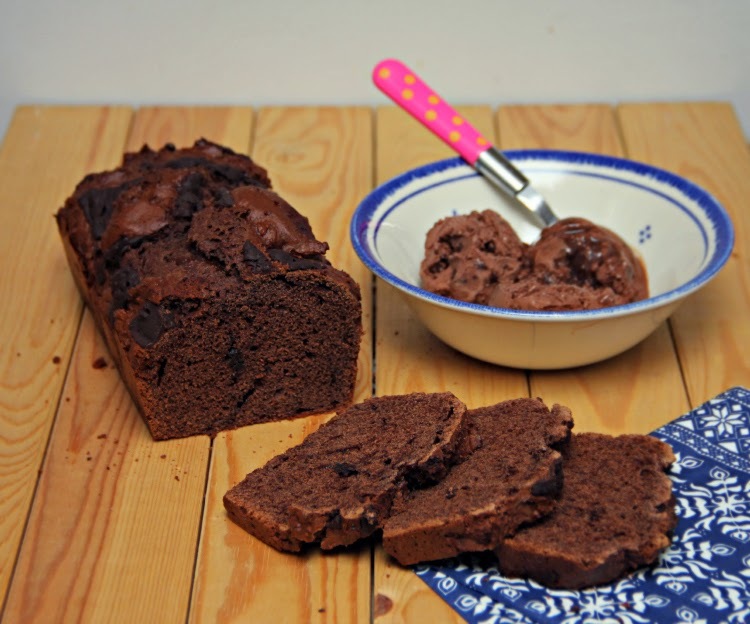 Have you made ice cream bread? Did you like it? Let me know if you give it a try, I'd love to hear how yours turned out! Let ice cream thaw until quite soft. Preheat oven to 175°C. Mix ice cream, flour and baking powder until just combined. You can use your mixer or a spoon for this. Pour batter into a lined loaf tin and bake for about 60 minutes or until a skewer inserted in the middle comes out clean. Let cool in the tin for about 10 minutes before transferring the loaf to a cooling rack. i'm glad you commented on my blog bc it made me realize you weren't in my bloglovin feed. now it looks like i have some catching up to do— glad i'll be updated from now on though! This is amazing! I am going to try this. Going to browse the ice-cream in the supermarket to see what I can come up with.